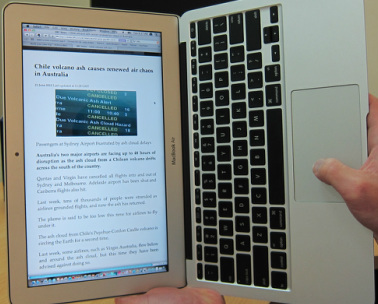 Read your MacBook like a book book. Rotate your screen and BUILT-IN TOUCHPAD to portrait mode. Relax with Screen Rotate for Mac. Works great with iBooks in Mavericks!! What does Screen Rotate do? Screen Rotate for Mac is an application that transforms the way that you will use your MacBook Air. Rotates the widescreen format of your display to the left or right for portrait viewing. Rotates the tracking of built-in touchpad for portrait viewing. Switches the orientation of arrow keys for portrait viewing. Rotation is controlled with a small, three button window that appears in the lower lefthand corner of the screen. How does Screen Rotate benefit me? We think that Screen Rotate will show you a whole new side of your MacBook Air. Hold your MacBook or MacBook Air more naturally...like a book. Tables and desks are great for working, but reclining in your favorite chair is much better for reading or browsing. Editing documents? View the entire page on your screen in Pages, Word, PDFpen, Bento, File Maker Pro and more. Keeps your Mac and lap cool. iBooks is now available with the release of Mavericks OS. Now you've got even more access to your content. An app is much easier to carry around than another gadget! “Your screen rotate app is insane!!! Have been looking for this a long time. Makes me miss my ipad less ;)”	- Rob B. “App is very cool. I was really impressed.”	- Bryan W.
"Firstly, thanks for a great app at a great price. It's so much better than the other options I've tried." - Martin H.
"Wow,Wow and Wow again! I downloaded the trial version on my new 11" Air, downloaded the Kindle App for Mac, and I am in Reader's Nirvana. Great App., love the trackpad orientation and I like your logo sitting on my dock. I don't know of many $4.99 apps that deliver this well. I encourage every Macbook Air (especially the 11") owner to purchase this app. No, I am not affiliated with Mac Screen Rotate, but I wish I was, 'cause it's a winner! " - Larry P.